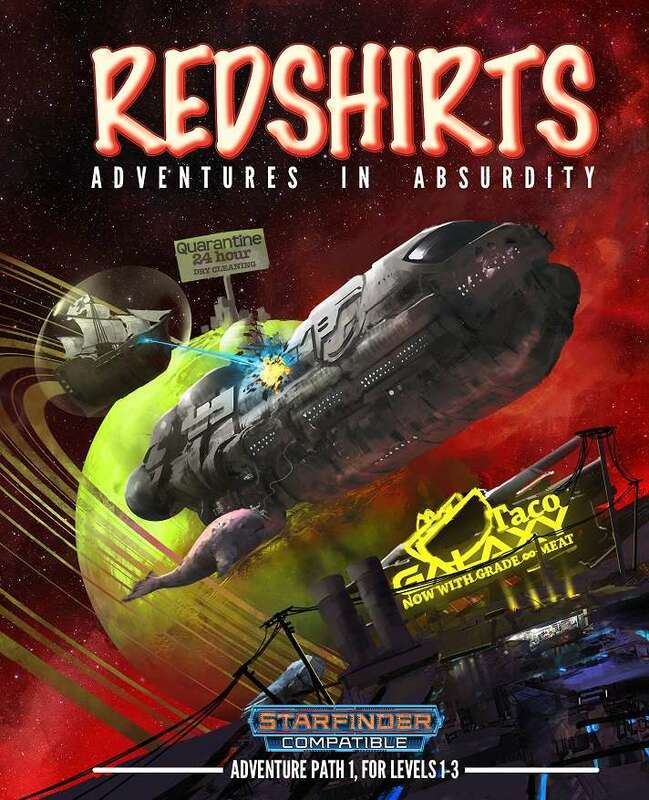 Redshirts is a Starfinder Compatible Adventure Path from Happy Gnome Publishing, that takes players from level 1-3, over the course of several ridiculous chapters. While the setting itself has nothing to do with the Golarion System of the Starfinder RPG, most of the basic rules and mechanics use the Starfinder Core Rulebook and you will need access to those rules in order to play the Redshirts AP. It should be noted that even if you don’t have the actual Starfinder rules, it’s not hard to adapt to other d20 systems that are also using the Open Gaming Licence, or just read it for fun. One of best things about Redshirts is its simple, easy, layout. When you look at a page you know, without reading a single word, what is on that page. NPC info, plot, dialogue, encounters, everything is very clear. There are a few moments when the layout gets in the way of the flow, but most of the time I loved how accessible it made everything. In a lot of ways, I preferred it over the way official Paizo adventures are written and formatted. Redshirts is set in a future where Earth has gone out and colonized the universe, forming the Confederation of United Nebuls, Terrestrials, and Sidereals which is currently at war with the Society of Joined Worlds; I will leave you to figure out those two acronyms yourself. While at least variants some of the core races from Starfinder exist in the Redshirts setting, most of the non-human races are unique to it. All the new races are great fun, with names like the Sushians, Plushians, and Door-tu-Dorans. The whole game is an irreverent romp through a universe that makes Red Dwarf and Galaxy Quest look dull, and feels like what everyone’s worst-case-nightmares might have been before watching The Orville. One of the things that make reviewing any RPG adventure difficult, is that you don’t want to spoil the plot. This becomes more difficult with an Adventure Path that is tightly serialized with a continuing plot. Redshirts, however, plays out less like a Peter Jackson 12 hour movie split into a trilogy, and more like a sitcom that grows and evolves with its characters. So with that in mind, I can still give a decent summary of each chapter, without giving away any sort of major spoilers, and any minors spoilers will be incidental. Whether you use one of the pre-generated characters or build your own from the Starfinder rules, players start as level one characters awaiting the arrival of the ship you will be spending the next five years of your career on, the CSS Uranus Hertz. When the ship arrives, you are greeted by your new Chief of Security, Lt Mitzy Stuffington. The three foot tall, bright pink, teddy-bear-looking Plushian greets you with a disturbingly enthusiast hug, before flouncing off to show you around your new home. Before long you meet your new Captain, Ginny Tonic, who orders you to get the ship’s very unique shuttle working and use it to pick her up some lunch at a nearby Taco Galaxy restaurant. Assuming the players survive this introductory adventure, their characters are able to advance to level two. For most RPG games such advancement of characters is based on some sort of experience points (XP) for completing specific obstacles and objectives. This is basically a holdover from the days when published adventures had a specific character level they were written for, and there was an obvious need for a way to get better before, and potentially after, that adventure. It’s a function that isn’t really necessary for a continuous story arc, where everyone knows that some sort of advancement will probably happen at the conclusion. If the character survived today, they will get better before tomorrow’s game. Redshirts simply removes the premise of specific XP, and you just advance at the end of the chapter. It’s simple, it doesn’t take math, and I love it. The one thing that does take some math, is wealth. Starfinder assumes that as players get more experience they also accumulate more money. You still have the ability to do that in Redshirts, and each chapter summarizes (for the GM) those opportunities, which should keep players roughly in line with the Wealth by Level chart in the Starfinder Core Rulebook. Chapter 2 introduces the First Officer of the Uranus Hertz, Commander Laissez Faire. Well-known for putting his own financial well being over the safety of his crew, the Commander gives the players an “informal” assignment to take the shuttle to Nexum V, and retrieve his dry cleaning. He sends the players off with only the reminder that this dry cleaning is very private, and that he trusts their discretion not to look any further into it. After advancing at the conclusion of the previous chapter, the now level 3 players are called into the ship’s conference room, where your obviously unimpressed First Officer introduces Specialist Gila Pyke from the engineering department. It seems that someone has been stealing, and likely selling, vital spare parts leaving the ship stranded. So for Chapter 3, players are sent to buy some black market parts from the Space Station known as Pirate Cove. However, the station’s owner, Captain Nemo Orangefin, gives the players three tasks they must complete for him before he is willing to sell them the parts that they need. The first volume of this adventure path concludes after that point, the book closing with an appendix containing maps, racial information, and a handful of pre-generated characters. Basically, anything that might need expanding on, or referenced again later. 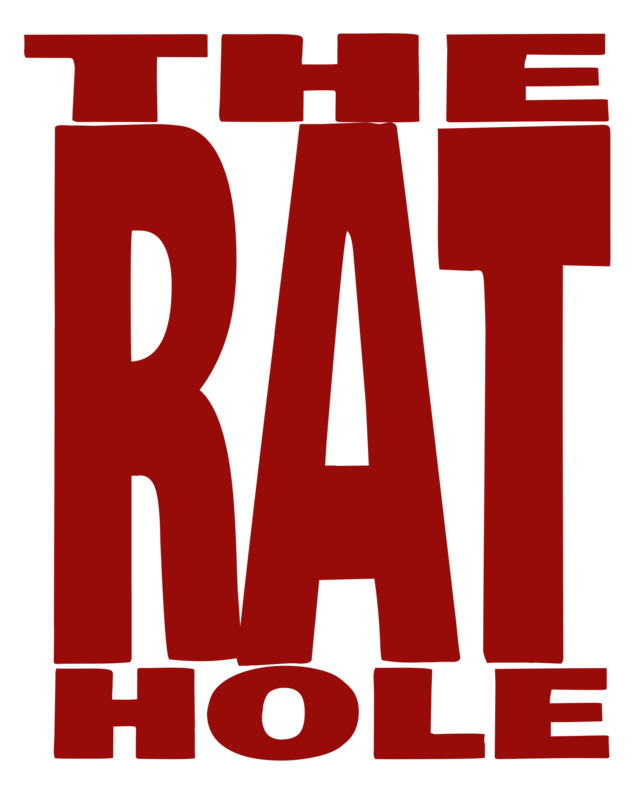 As I started this review by saying, even if, for some inexplicably dull reason, you don’t really want to play this sort of adventure, the entertainment value still makes it worth picking up and reading. If you think Volume 1 sounded fun, you can buy it on DriveThruRPG.com and also get in on the bottom floor of Redshirts: Adventures in Absurdity (Volume 2), on Kickstarter until February 24.